FREE 2019 Planner after rebate!! Are you looking for a way to help you achieve your goals and stay on track in the new year? Then you don’t want to miss this FREE 2019 Planner! TopCashBack is offering an $9.99 rebate on the 2019 Planner in Pink Ombre or Blue Ombre purchased from Target, making it FREE! 1. Head here for the special 2019 Planner offer and sign up for a new Top Cash Back account. 2. 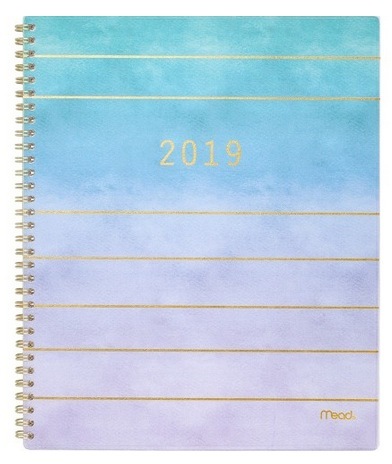 Order a 2019 Planner in Pink Ombre or Blue Ombre for $9.99. Select free in-store pickup at your local Target to avoid shipping costs. 3. Within 21 days, your Top Cash Back account will be credited with $9.99 — all you’ll pay is a little bit of tax! 4. After you receive the $9.99 payment in your Top Cash Back account, you can choose to transfer it to your bank account or request a Paypal payment. This deal is valid through January 13, 2019 — or while supplies last. I keep seeing deals for “NEW Top cash back members”. I have yet to sign up, though all the new members deals look great! Is it worth it after signing up? what is top cash back like after signing up? You could just sign up for the new member offer, you don’t have to do anything after that if you don’t want to. But you could also choose to continue making online purchases through them and earning cashback! I am also a member of Ibotta and Ebates. I wish there was a way to link all of these “shop through us and get cash back!” sites. Have you found a way to combine to get the most reward? You can’t combine some of them, but others you can! We try to post here when there is a really great deal where you can combine two at a time.